Volutes (family Volutidae) are marine predatory snails which often have very colourful and smooth shells. They are particularly well represented in the Australian fauna. The Zebra Volute lives in shallow, usually subtidal sand banks where it seeks out other snails and clams for food. 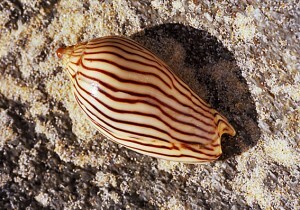 The striped colour pattern on the shell (length to 50mm) gives the species its common name, but there are several other species of Australian volute which likewise have striped shells. The Zebra Volute is a relatively common species, but most often seen washed up as a beach-shell rather than alive. Like other members of the volute family, it hatches direct from an egg-capsule rather than as a planktonic stage. This type of life cycle is known as direct development and renders species such as the Zebra Volute subject to local extinction if over-collected. Indigenous: Queensland to New South Wales only.